A plate loaded machine built with 2" square HD steel. 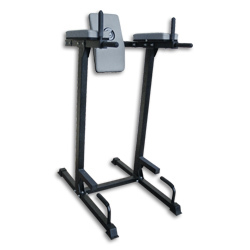 This machine has a comfortable chest pad covered with durable vinyl and swivel handle bar for proper support and angle while doing heavy duty lifting and strength training. Designed to develop the rhomboids, trapezius anterior deltoids and biceps. Will accomodate olympic style plates only. Black powder coated finish. Pad color options: Black, Gray. 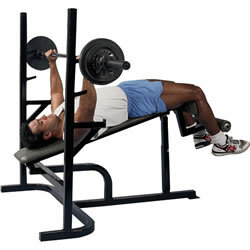 • Left, right, front and back; this 4-way machine works all the neck muscles. • Arm pivots on precision flange bearings to provide a smooth action. 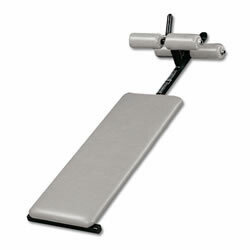 • Removable pin is used to restrict direction of head movement. • Fully adjustable seat height. • Constructed of 2" square heavy wall steel tubing. • Durable textured black powder coat finish; Black or Gray pads. This product ships by truck. The vertical abdominal raise for progressive bent-knee or straight leg lifts, firms, trims and develops the abdominal area. Arm and back pads are angled to eliminate lower back stress. Also designed for dips and push ups. Constructed of 2" square ste. This product ships by truck. 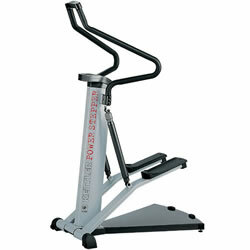 Adjusts 6 positions from 0 to 30 degree incline. Fully padded board, ankle and knee pads for comfort and support. 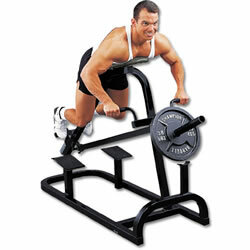 Excellent training for the heart and lungs while simultaneously strengthening the muscles of the seat and legs. The foot-plate surfaces are mounted on separate bearings, thus allowing a natural climbing movement. • Training computer measures time, stepping speed, steps climbed per session, energy consumption, total height climbed, pulse rate.